This product update is not going to be a fully detailed review. While I will get into some of the features at a high level, I mostly wanted to call out some of the things I noticed with the new version for those of you familiar with the original Sense Mantra. I was in a Salomon phase for the good portion of two years, which ended sometime in 2012. Salomon makes great shoes and are loved by many, but no matter what I did, I just couldn’t get them to work for me (blister issues); the exception being the Sense Mantra. Salomon bills the Mantra as the road-to-trail trainer version of their racing shoe, the Sense Pro. While I do often run in many other shoe brands and models, I have found the Mantra to be “Mr. Dependable” in a sense (no pun intended). It is perfect for road/trail hybrid routes and on trails with lower technicality (due to their rather modest and shallow lug/tread pattern). 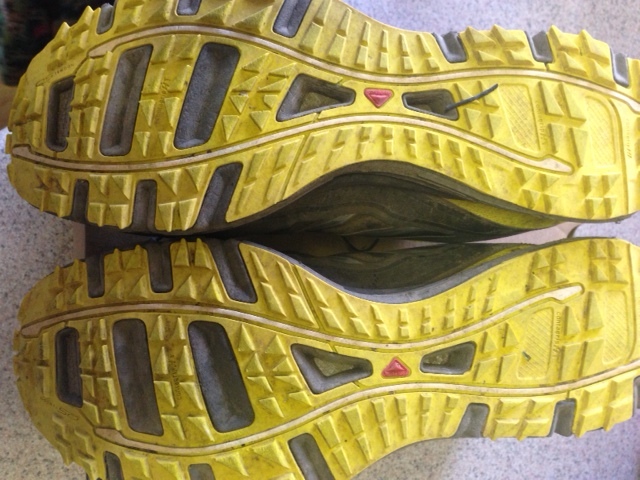 Even though it is advertised as a trainer, I have found that they are light and responsive enough for races as well. I could throw out some of their other marketing terms, but the important takeaway here is that this shoe fits like a glove without sacrificing room in the toe box. The heel-to-toe drop is on the lower side, but not so low that those with zero drop issues should be concerned. 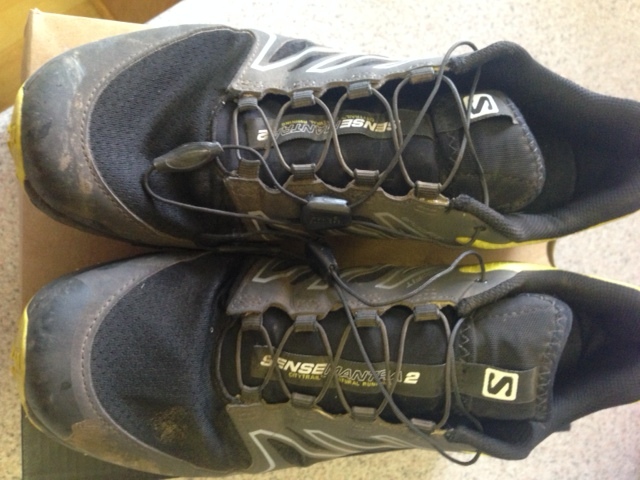 It also uses Salomon’s Quicklace system, which is the only out-of-the-box quick lace system that I have liked thus far. Here are a couple pictures of my pair after 75 miles. They still look brand new except for being a little dirty. I felt slight pressure on my little toes that I never experienced with the original Mantras. It did not cause any bruising or toenail issues, but it was definitely a new, albeit minor, difference. I got some lace bruising on the top of my feet. It could have been because I cinched the quick laces too tight, but as someone who has worn the Mantras since they came out and is quite familiar with the Salomon quick laces, I think it may be more related to some slight changes in the fit of the upper. If you like this post and would like to stay up to date on other running related stuff, please follow my Facebook page at Ultrarunner Joe! This entry was posted in Gear Reviews and tagged running, Salomon, Sense Mantra, Sense Mantra 2, shoes, trail running, ultra running, ultrarunning by Ultrarunner Joe. Bookmark the permalink.